The PRIDE program was created in Ft. Meade, Florida and has spread across the country as a means to reward personal responsibility. There have been a variety of implementations of the program across schools and grade levels. The engine for PRIDE lies in various rewards for certain behavior. At the high school level, PRIDE tickets can be handed out when certain criteria is met with academics and/or behavior. At Mitchell High School in Blacktown, Australia, PRIDE cards [Archive] are awarded for that give discounts to local restaurants and businesses. Students have to meet high standard of school community spirit through good attendance patterns, personal presentation (uniform), participation in school and local community events, behavior and effort. At East Hartford High School, PRIDE nights are held throughout the year. These nights include a space where kids can play badminton, volleyball, double-dutch, ping-pong, or basketball. There is a raffle where they give away prizes donated by local businesses. Free refreshments are served from contributing local businesses. Only students who meet the criteria each month can attend these events. At Cleaveland Magnet Elementary School in Wichita, Kansas, they use the PRIDE program [Archive] to encourage character building. Each month teachers and staff nominate students who exhibit good behavior, attendance, and academics. Students get their names and their picture on a character building bulletin board and are honored at an awards ceremony. A popular adaptation of the PRIDE program is done by the Indianapolis Public Schools and others. The adaptation has had some success with behavior management in inner-city schools where students need immediate rewards and consequences for behavior. Below you will see examples of how PRIDE has been applied in some schools. This chart uses clothes pins with student names so the clips can move up and down throughout the day. Everyone starts out on green and moves up and down from that point. 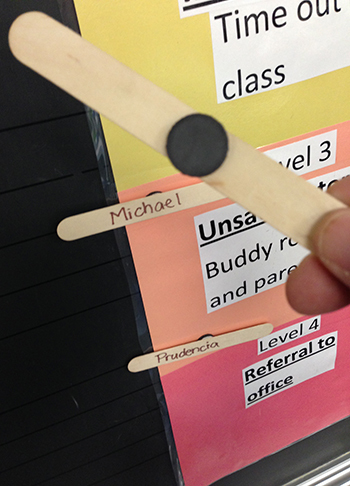 In most cases, if a student begins behaving after being "clipped down," their clip can then be moved up once again at the teacher's discretion. The chart above is connected to a yard stick that is carried by a designated student as the class goes to lunch, recess, restrooms, or specials. This will enable others to use it if needed. When not being carried, it is held on to a white board with magnetic clips. Click on the image for full size. The chart above is not mobile and hangs on a white board. As in the other chart, all the clothes pins with student names begin on the green square and then move up or down throughout the day. Most teachers offer some rewards if a student ends the day on the top purple square. Incentives may include candy, crayon boxes, pencils, erasers, pencil sharpeners, collector cards, or tickets good toward some kind of reward. In this chart, there is only one consequence listed - a call home. It might be wise to add time-outs or other consequences. Click on the image for full size. This chart uses pop-sickle sticks that have small magnets glued to the back of them (See image above). The chart is also stuck on the black or white board using magnets. The pop-sickles are then moved up and down throughout the day. As you can see in this example, there are fewer colors and a "buddy room" and office referral have been added. Some teachers "clip up" a student if they turn in their homework. Click on the images for full size. The chart on the left is more portable and is a yard stick or piece of long wood that has been painted different colors. As with the others, clothes pins are moved up and down the yard stick throughout the day. This one is easier to carry in other areas of the school and is sturdier. Some teachers count each color as points. Green = 2 points, blue = 3 points, pink = 4 points, and purple = 5 points. These points can then be tallied throughout the week, month, or quarter. In the school with the chart above, 125 PRIDE points will allow students to attend a party. Each quarter a different event is planned. Some teachers also send home a sheet for parents to sign that also includes the color they ended up on at the end of the day. A parent volunteer or employee mans the "buddy room" where students go when they reach the pink color. During the time in the buddy room they are to write out a reflection on their behavior, why it was wrong, and how they plan on solving the problem.